Located in a European-inspired neighborhood setting, Hotel Valencia Santana Row blends classic, hip and high-tech in this one-of-a-kind contemporary luxury hotel. There's nothing else like it in San Jose! 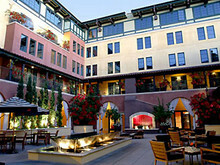 From Hotel Valencia Santana Row's expansive courtyard with a bedazzling fire and water feature to the dramatic three-story vaulted stone entry, Hotel Valencia surrounds guests with a four-star experience, luxurious lodging amenities, cutting-edge technology and uncompromising personal service. 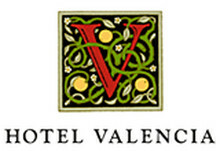 At its doorstep, Hotel Valencia offers Santana Row luxury and lifestyle shopping (Gucci, Escada and more!) and a spectacular array of dining options. 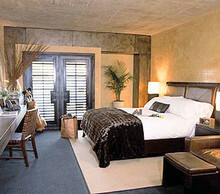 Hotel Valencia's sleek, sophisticated guest rooms offer a serene escape from the outside world. Custom made Hotel Valencia beds are swaddled in luxurious Egyptian cotton bed linens. And guests enjoy the waffle weave cotton bath robes and fragrant bath amenities by famed California apothecary Lather®. When you're fully rested and want to be where the action is, visit Vbar, where you can sip martinis, sample the West Coast's first ceviche bar and enjoy the Vbar's balcony view overlooking the Santana Row street scene until 1:30 am. Situated in the heart of Santana Row, San Jose’s elite European-style shopping neighborhood, Hotel Valencia caters to Silicon Valley’s see-and-be-seen crowd. A short drive from San Jose International Airport and downtown San Jose, Hotel Valencia is walking distance from movie theaters, restaurants, bars and upscale shops such as Gucci and Ted Baker. Sleek, modern lines and plush accents adorn the well-appointed rooms. Creature comforts include 300 thread count sheets, 42-inch flat panel TVs and toiletries by Lather. A lengthy list of amenities includes complimentary breakfast, ayurvedic spa treatments at the adjacent AYOMA LifeSpa, pool, fitness facility, business center and free high-speed internet access. Guests can sip wine and take in sweeping views of Silicon Valley and the Santa Cruz Mountains at Cielo, the hotel’s rooftop wine bar. The adjacent V Bar and Citrus restaurant draw well-dressed revelers on weekends, and surrounding restaurants including Blowfish Sushi To Die For, Left Bank and Pizza Antica offer a range of dining options. View current special offers and packages.